Rebecca Goldberg is killing it in 2016. With her first 3 releases under her belt, a debut performance at Movement Festival and a Europe tour that starts today, Rebecca is poised to take the dancefloor by storm. Her hard work and dedication to her craft is apparent in everything she touches. From performing her score for silent film Trip to the Moon at David Lynch’s underground club in Paris, Silencio, to working as a freelance graphic designer in the city, Rebecca is what she calls “a working artist” and aims to “learn something new everyday.” Whether she’s creating album artwork for a local musician or working on her own productions, she puts every ounce of creative juice into her projects. 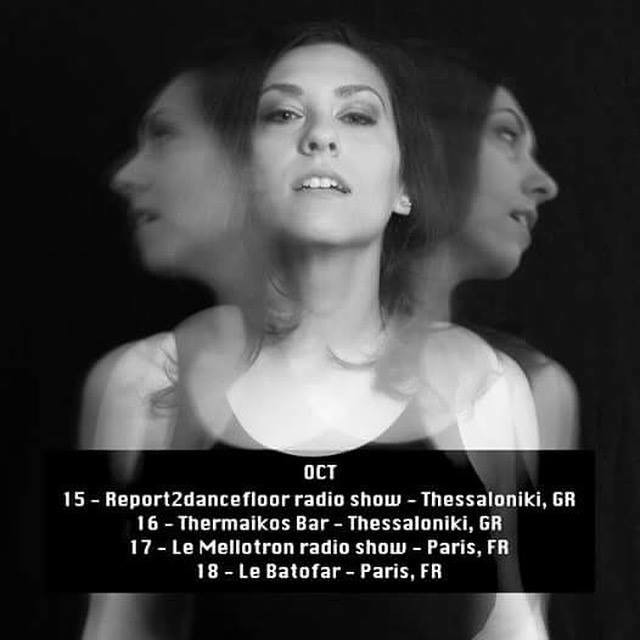 We were thrilled to catch up with her ahead of her Europe tour, which begins with a live DJ show for Report2Dancefloor, and discuss influences, studio favorites, the concept behind her latest release, and what’s next for this rising star. RP: Tell us about your musical background – have you always been into music? RG: I grew up listening to the radio. I spent a lot of time acquiring different boomboxes and that turned into CD players, so I was always making mixtapes/mixed CDs and finding music. I started working at the age of 14 years old and I would always use a portion of my paycheck to go to Harmony House and pick up CDs. My parents are really into music –my mom is a pianist and plays the accordion and my dad is more into the technology side of music – so that put it all together for me. Once I was old enough to start going out, I realized that this was something you could do for a living. A lot of this business is about connections –those are really important. I was connected with someone that was a DJ and I begged for almost a year for them to teach me. This person finally agreed to mentor me but had some stipulations. I had to learn to set up and tear down all the gear and I started collecting records because, “you’re not showing up to gigs with a computer,” my mentor said. I’m so grateful for learning that way because I’m always super prepared; now I can walk into any situation and really adapt to whatever I need to. I know how to set up and break down on my own and it’s self-sustaining. At the end of the day it’s about presenting the music that I love and the fact that I get to do that around the world still blows my mind. You used to go by “CASH4GOLD” and now you go by your name “Rebecca Goldberg.” What made you decide to make the switch? It was advice I got from someone who is more experienced in the business side of DJing. I wanted to travel more, gain more recognition and morph it more into a career than a hobby and that was some advice I got. It’s more identifiable, it’s a strong name and there’s no confusion about who I am and so far it’s been working in my favor. Sometimes I miss CASH4GOLD, some people still call me that and I still buy gold sneakers all the time. It’s very much a part of me and my beginnings…I think about bringing her back every once in a while but I’m still me for now. Tell us about your latest release, Activity of Sound? What’s the concept behind the project? I love Activity of Sound – I started creating the sounds and concepts about a year ago. I’m very much into experimental music –noise, avant-garde style. I had been reading about composers like John Cage, who is a huge influence of mine. Something I’m always fascinated by is sounds that exist – specifically nature sounds and urban sounds. When I was in Greece last year, I was taking in all of these foreign sounds. For example, ambulances sound different in Europe. They have public transportation in Athens and I was nerding out over the way that the metro station would sound at certain times and the voice announcing train departures was really cool to me. They would say everything in Greek and then in English with a Greek accent but these are things that you wouldn’t think about unless you’re there experiencing them. I was constantly recording stuff. At the same time, I was getting into music production techniques like sampling and recording. I had the opportunity to go to Paris – and I spent time discovering sounds native to them – like the elevator sounds at my friend Yoann’s flat and other transportation sounds. So I had learned all the techniques, recorded all these sounds and thought, “What can I do with all of this?” It’s almost like a study of all these sounds in different locations and you take all those sounds out of their original context and put them all into a composition. I had the opportunity to play the ambient room a couple times at BAK DØR after-hours party that was going on. Those are some of my favorite gigs I’ve done because they just let me do whatever I want. They asked me to play the last BAK DØR in the ambient room, so I pitched the project I was working on (Activity of Sound) and I asked if I could record it live for the last show and release it. They said, “Absolutely let’s do it.” It was kind of crazy because it was 3am and I was dropping samples of train sounds and totally left field type stuff – a lot of people were into it. I’m really happy with how the release came out. I still have a lot of places to go so I’m not done doing stuff like that— there may be an “Activity of Sound #2” one day. How has growing up in Metro Detroit influenced your sound? I don’t know if I necessarily realized the influence it had on me until my DJing life started. Like I said, I grew up listening to the radio. Stacey Hotwaxx Hale would do live radio shows all the time that I used to listen to. Fast forward years later and now I’ve gotten to work with firsthand with her and others that are carrying the tradition of Detroit techno. Detroit 100% has influenced my sound simply because the people I’m around. House/techno and all the subgenres that exist in the city— this is our version of a folk tradition and we are “in it” — we are the ones playing it around the world. I’ve been working at Detroit Threads since May— which is really important to me. I get to see everyone’s new releases and pass them on to people who are shopping and looking to learn more. I still have a lot to learn, too. I try to learn something every day. It’s such a sense of community and it’s important here. We really care about maintaining what it means to be a Detroit artist. Especially now that I’m traveling I feel like I’m an ambassador for the city and that’s a lot to carry. And I’m fortunate I get to do it but I work really hard to know as much as I can so I’m representing it correctly. What’s your favorite hardware/software to use when producing? I’ve got a few hardware pieces but I think my favorite still is my first one I purchased— the Roland TB3— it is their Aira series version of the classic 303 drum machine. It’s got some amazingly weird/really crazy sounds and I use it on everything I produce. You can have all this gear but sometimes it’s too many choices. I’d rather hone in and become an expert with what I’m working with now. I’ve got a Korg synth, classic Yamaha DX7 which I love (it’s in every 80s song you’ve ever heard in your life)and I use Ableton live for software. Tell us about your Europe tour – which starts tomorrow! My tour starts in Thessaloniki, Greece – a beautiful city in the Northern part of the country. I’m starting off doing a radio podcast live with Report2Dancefloor Radio, who I met through some friends in Detroit. It was international women’s day and they’re really into Detroit techno and they wanted female DJs from Detroit to be featured on the show so I did that about a year ago. I’m really good about staying in touch with people from other places. I want to try and reach as many people as I can so I visited them last year around this time and we’ll be doing the same thing this Saturday. The other gig I’m playing is Thermaikos Bar (also in Thessaloniki) so my friends who do the podcast are also promoters and they’re bringing Surgeon in to play on Saturday night. So that’s kind of how this all got started, you know I reached out to them and told them I really wanted to see Surgeon and see them again so we’re going to the Surgeon show Saturday night, doing the radio Saturday and then Sunday I’m headlining at Thermaikos Bar. I fly to France on Monday and I’ll be doing Le Mellotron radio show and Tuesday I’m playing at Le Batofar, which is a club/venue that’s on a boat in the Seine river. My friends there are independent filmmakers and they included me in a documentary that they shot last year called, “Music on the Road” and they travelled across the US to feature contemporary artists about historical music genres in their area. In Detroit they featured a techno artist, soul musician and a hip-hop artist and I was the techno artist. I was in France for the premiere in February and I stayed in touch with those guys and they’re going to have me back for another documentary related event/screening and party on Tuesday. In the next week I’ll be on 10 airplanes, 6 trains and 5 countries—its travel intensive but I like it. Any upcoming releases our readers should know about? I was asked to contribute a track to Detroit Electronic Quarterly – there’s a vinyl release and magazine that accompanies the release. That will come out right before Movement. I’d like to put out an actual record in the spring so I’ve been working since August to get an EP together to put out on vinyl.